Hey Peeps! I am sorry that I have been a little distant the last few days. I don’t even have a good reason! I need some inspiration people! Friday “mama Jules” & I decided it was a shopping day. Well, she decided it was a shopping day. I wanted to go to a movie since I am trying to make it a Friday tradition. But shopping was ok too. We somehow ended up at Kohl’s Power Hour. That place has crazy good deals that I cannot believe. And the discounts somehow just keep on coming when you are there. I highly recommend opening a charge card as well! That is the only one that I have from a department store…and it is worth it! Does anybody else share my same Kohl’s passion out there? And did I mention how cute their Christmas stuff is? Yesterday my Godmother Mary (I am sure you all know who she is! Love her!) came over for a nice long visit. She always brings us a pile of magazines that she gets from a flight attendant that picks them up off the airplanes. Another great way for mom & I to get our trashy entertainment scoop! Thanks Mary! Then mom and I spent the afternoon watching Lifetime movies. Those things are so addicting!!! I had the evening off (given to me from my dad), so I was able to get some errands done before the ice storm came in. I have heard from multiple people today that have been in minor car wrecks or were stuck. Ice can sometimes be worse than snow! I am glad that nobody was hurt! 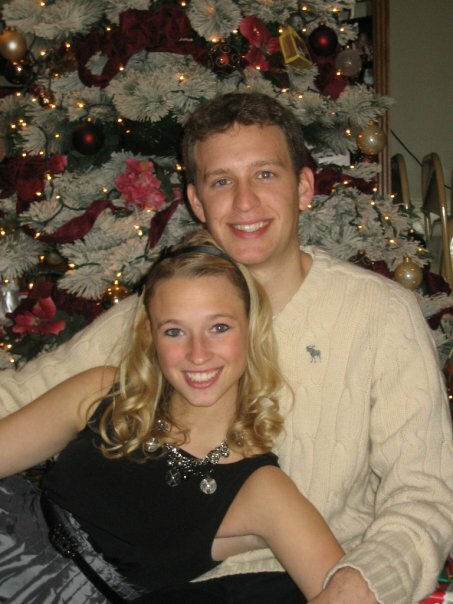 Jenna & Ross in front of out tree last year! Today my mom & I watched the Vikings game on TV. I cannot say that it was a very exciting game. Kind of depressing. My mom will continue watching anyway! Love my little sports fan! I spent the rest of the afternoon putting up our Christmas tree. I have talked to several people who have put their’s up, so I figured we would too! It always makes my mom and I feel happier when we see that snow coming down. Jenna & Ross had an early Thanksgiving with Ross’ family today. They will be up north for the actual holiday, and Ross is on call….so we get to keep the kiddies close to home! Yay! That is it for now! Don’t give up on me…I will keep blogging! Thankful: I am thankful for the beauty of a Christmas Tree & the warm feeling it gives me in my heart. Ahhhhhh…….